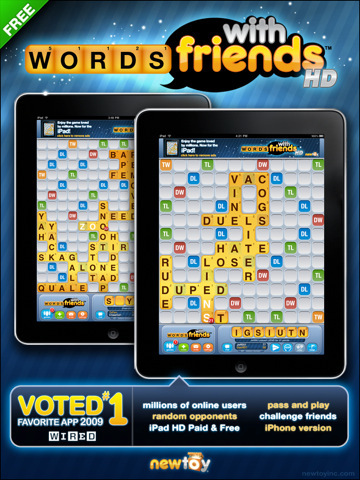 Zynga announced it’s snapping up Words with Friends game developer Newtoy to help expand its gaming empire into mobile. The pick-up gives Zynga a hot mobile studio, which has recorded 12 million downloads of Words with Friends on iOS, and a key partner in bringing its existing Facebook titles to mobile. Zynga has already made forays into mobile with games like FarmVille, Mafia Wars and others, amassing 10 million downloads on mobile devices. But it pales in comparison to the 215 million users who access its social games from a PC. David Ko, SVP of mobile for Zynga, said Newtoy will help Zynga offer its games to any user on any mobile device. The price of the deal wasn’t disclosed. McKinney, Texas-based Newtoy will now become Zynga With Friends and will have co-founder Paul Bettner as VP and GM, while brother David Bettner will serve as studio director. The company has a solid history in gaming with the Age of Empire series and is behind the Halo Wars strategy game. In mobile, the team has built a broader platform for social games using its Games with Friends network, which extends to titles such as Chess with Friends and We Rule. The acquisition, Zynga’s seventh in seven months and its most mobile-focused, underscores what I wrote about earlier how mobile is the future of social gaming. Online won’t go away, but with growth on Facebook stalled and users increasingly accessing games from mobile devices, it makes complete sense for Zynga to get more expertise in mobile. It also lessens Zynga’s reliance on Facebook, which has been lucrative but is also limiting. The acquisition also highlights the growing interest in social mobile games. Ngmoco was bought for $400 million in October by DeNA, while Tapulous was scooped up by Disney (s dis) in July. Expect more acquisitions as companies look to tap the market for mobile games, which Juniper Research said will hit $11 billion worldwide by 2015. This is where the heat is, and especially with the growth of freemium games on mobile, it’s a lucrative opportunity that can leverage existing online experience.